Cut out a half circle, a bow-tie, a collar and a dot using any leftover paper you have around. Roll the half circle into a cone shape and glue the dot on top to create a party hat. 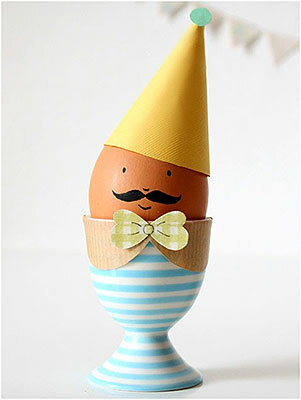 Attach the collar and bow-tie to the eggcup and place the egg inside. Have your kid draw a fun face and top it off with the party hat.